With the right equipment and techniques it may be possible for our future geologist to eventually get a reasonable if not exact date match between these two mud samples. But what about the poor field geologist, someone like the pioneer English surveyor and mapmaker William Smith, tramping back and forth across the British Isles by horseback, carriage and on foot trying to match strata on a regional scale? In the early days of geological mapping, the main problem was just trying to obtain any kind of match between strata that are only visible in scattered outcrops across England's 'green and pleasant land', in rock quarries, canal cuttings and boreholes excavated for wells and coal. 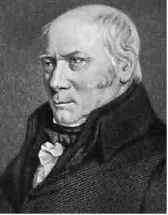 William Smith, 1769-1839, an English land surveyor and civil engineer, compiled and published the first Delineation of the Strata of England and Wales in 1815. He recognised that successive strata contained distinct fossil assemblages that could be used to match and map the rocks over wide areas. Awarded the first Wollaston medal by the Geological Society of London (1831) and an honorary doctorate by Trinity College, Dublin. or lakes or under particular climates such as those of tropical rainforests (coal) or glacial conditions (till deposits). More often, environment and climate combined to produce a characteristic sediment that subsequently became a distinct rock type (or lithology, as it is technically called). For instance, warm tropical waters with high evaporation rates promote the development of lime-rich (calcium carbonate) sediments and the growth of reefs with all their diverse organisms. When solidified into limestone rock, such strata are easily distinguishable from other kinds of sedimentary rocks such as sandstones that were originally laid down offshore, in river deltas or in deserts. Everywhere on Earth has, over time, experienced environmental change. 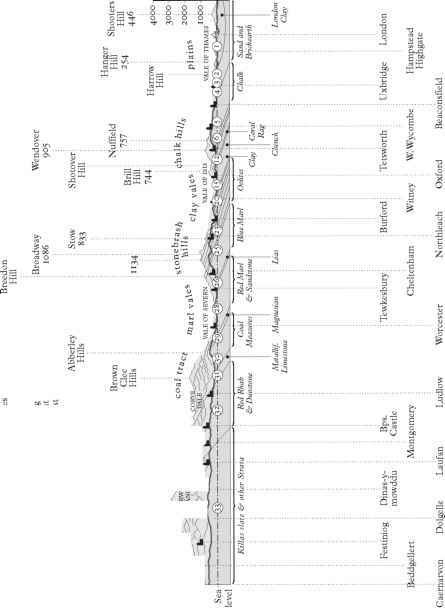 Consequently, the nature of sediments deposited in each location changes and this can be readily seen in the layered nature of the resulting strata. In most places on the Earth's surface, a hole drilled straight down into the Earth will pass through successive layers of rock strata that reveal a history of dramatic change at that location. Although distinct environments of deposition produce characteristic sedimentary rocks, such environments and their sediments have recurred throughout much of Earth Time. For instance, any one sandstone or limestone can appear, superficially at least, very much like another sandstone or limestone. Various types of detailed analysis will be able to tell just how similar or dissimilar they are in composition, but proof of similar or relative age can be more difficult. 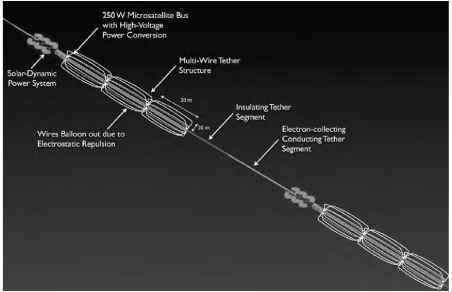 William Smith and his French contemporaries Georges Cuvier and Alexandre Brongniart found a solution to the problem. Independently, they realised that successive strata were generally characterised by particular kinds of fossils. Smith made collections of the characteristic strata and fossils for much of England and Wales and arranged them in the order in which they were found to lie one upon another. For instance, around Oxford, Smith found a distinctive series of limestones, the youngest of which was called the Cornbrash by quarrymen. Below lay the Forest Marble, Freestone and Blue Marl, all with particular characters and fossils, before a major change occurred with the appearance of the Lias clays and limestones and then Red Marl and so on. Smith found that he could often identify and trace some strata across the landscape purely by the appearance of the rock. 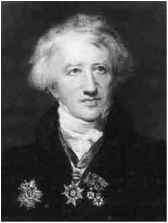 Baron Georges Cuvier, 1769-1832, professor of animal anatomy at the National Museum of Natural History in Paris and author of many pioneering studies on extinct animals such as the mammoth. He also compiled a geological map of the Paris region with Alexandre Brongniart.